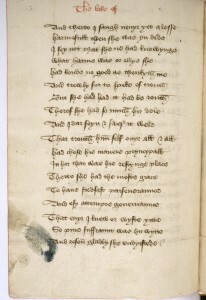 The stanzas below are the first two stanzas of an envoy poem Copland adds to The Assemblie of Foules (1530), his printing of Geoffrey Chaucer’s Parliament of Fowls. He describes the manuscript’s terrible state, which leaves it literally ‘on the shelf’, unloved and unread. He tells the manuscript that his printing of the text will rescue it to live again on the snow-white pages of the printed book. Chaucer’s language remains the same, but the material conditions of its existence and survival are transformed. It’s an interesting moment in the history of technology: the manuscript looks frail whilst the printed book looks fresh and new. If you’d like to find out more, Mary C Erler has edited Copland’s poems (University of Toronto Press, 1999) and has also shown that Copland used MS Bodley 638 as his source-text. 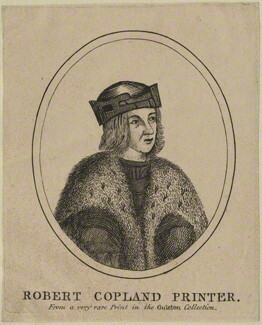 Erler compares the state of the surviving manuscript (the addressee of this poem) to the description Copland gives in the lenvoy. Alexandra Gillespie discusses Copland and this poem in her book on Print Culture and the Medieval Author: Chaucer, Lydgate, and their Books, 1473-1557. 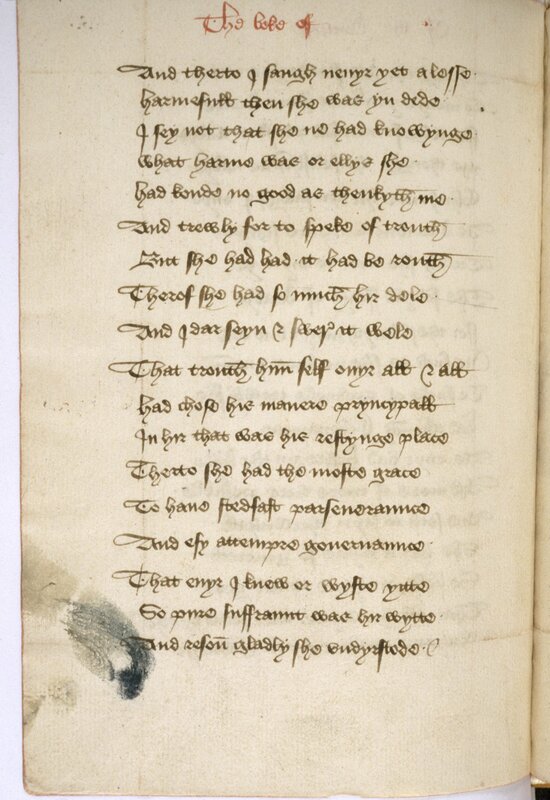 But nowe thou arte losed: go shewe forth thy sentence. Laid upon a shelf, written on tattered pages, with faded letters almost clean rubbed away, your covering rotten and all eaten away by worms, you lay in such a state that it was pitiful to see, trapped by your old quires [or ‘bound by your old wrappers’], all grey and sickly through age, your subject-matter sleeping because of the shortcomings of your current state, but now you are set free: go and show forth your meaning. Than methe moche sweter who can his mynde avewe. And wherever you end up, so arrange your language that you keep from blame your printer who has kept you from ruinous damage in order to preserve your subject-matter in snow-white paper in the exact same language that Chaucer gave to you in ancient terms of authority elucidated afresh much sweeter than meed for he who surveys it with his mind.